Alan Cotton at work in the Himalayas. Anyone who has spent time in the mountains will tell you of their immense beauty as the light changes rapidly, creating new shapes and views. It was this message that landscape artist Alan Cotton took with him on his trip to the top of the world to paint the 29,000 foot high Everest. "The scale was awesome," said Colaton Raleigh-based Alan as he proudly showed off his latest collection, which goes on exhibition at Messum's Fine Art, Cork Street, London, starting on September 12. "I had seen many pictures of Everest, but the reality transcended everything I could ever have imagined. You could not believe what you were seeing." Alan finally achieved a lifelong ambition to paint Everest when he visited Base Camp with explorer and friend David Hempleman- Adams last October. 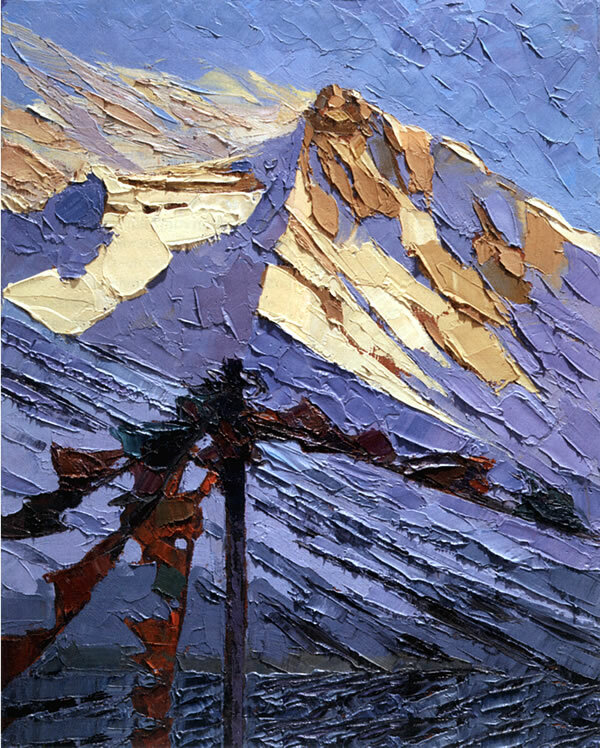 The outcome is a stunning collection of oils, each one capturing the true spirit of Everest, thanks to his sculptor-like use of painting knives. "The knife is so wonderful," said Alan. "It can make well over 100 different marks, using pressure, angle and nuances to give so many different effects. They are like scalpels - feel so right in the hand." 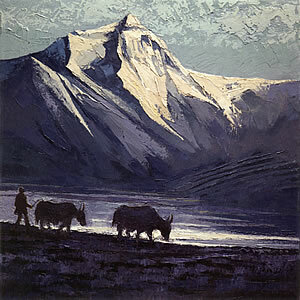 Alan had tried six months earlier to reach Base Camp as the expedition artist in a team led by Hempleman-Adams. But he was thwarted in his attempt when American students staged a protest at the Rongbuk Monastery, resulting in the Chinese police closing the route and telling all foreign visitors to leave Tibet. The artist, who was being accompanied by his son Robin, was bitterly disappointed. Months of long walks, rowing, cycling and gym sessions to get fit for the expedition had all been to no avail. Then David Hempleman-Adams phoned Alan, saying "We have to go back to Everest -just you and me. It's unfinished business." Alan and David landed at Kathmandu and were then driven in a 4x4 to the Tibetan border. "We travelled on unmade roads, going through all kinds of terrain and weather." They were aiming for the famous monastery at Rongbuk - at 16,700 feet, the highest ecclesiastical building in the world and just five kilometres from Base Camp. "There was increasing excitement as I got to Base Camp. The sense of being, sense of place, physically being on the spot." "Base Camp was empty," said Alan. 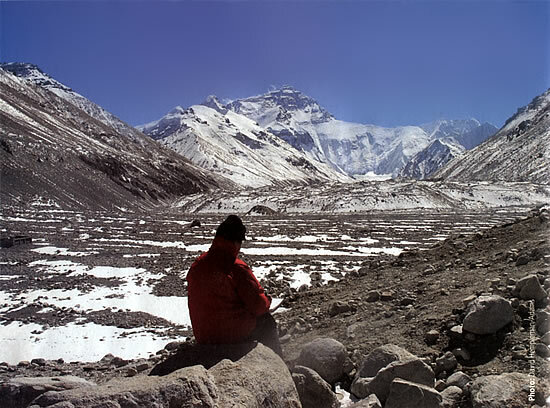 "It was late October and there were no Everest expeditions. Just David and me, and the occasional group of walkers." He remembered the excitement building as he got his first glimpses of the world's highest mountain. "Everest peeped through between the mountain ranges. There was increasing excitement as I got to Base Camp. The sense of being, sense of place, physically being on the spot." The two spent five days trekking back and forth to Base Camp, which stands in the shadow of Everest at - 18,000 feet. "One day we walked 10 miles to get different views of Everest. I would draw for an hour before getting too cold. .."
Alan wore six layers of clothes. "I never took them off for eight days and didn't shave. We slept in appalling conditions in austere rooms, some with no heating. It was 10 degrees below, but there was a roof! We slept in sleeping bags and you had to use a pee bottle. This meant you had to stand up and quickly undo certain parts of your clothing..."
On their walks to find the best views, Hempleman-Adams always kept a close eye on his pal. "He was watching me to see my nails and lips didn't go blue." Alan didn't suffer from altitude sickness, though he witnessed first hand the effect. "There was a young student who was desperately ill and a lady who was also poorly at about 1 1.000ft. There is only one cure - go down." Weather conditions couldn't have been better, giving clear skies during the day to see Everest bathed in stunning light. "The colours were amazing, changing according to the light." But how did Alan remember the colours? "You carry them in your head - a kind of colour palette." Alan also painted small watercolours, but had to put glycerine in the paint to stop it freezing. The highest he trekked was just below 20,000 feet. "It was very cold - 20 to 25 degrees below," he remembered, "with wind chill from Everest making it even colder." But all the discomfort was worth it. He's created an amazing insight into a mountain only a select few have visited. 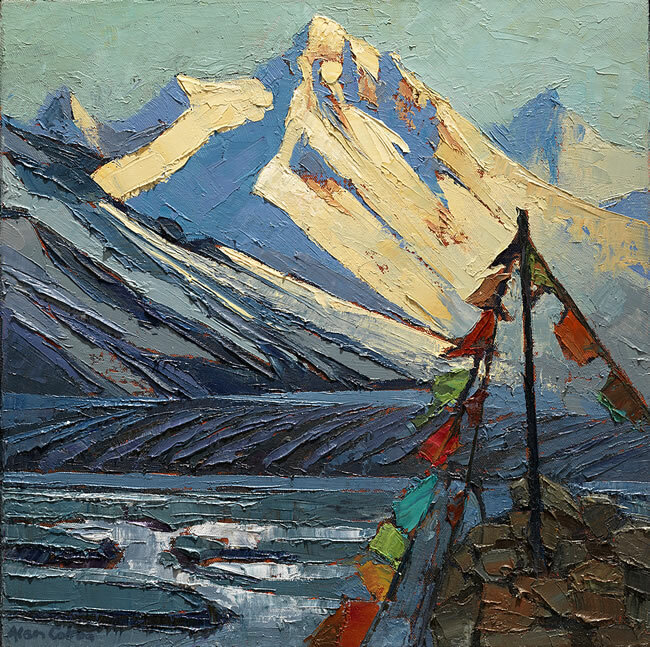 His use of colour and the knife have captured all its majesty and already there has been great interest shown in his forthcoming exhibition, especially from the few who have stood on Everest's summit. But that, in itself, has created a whole set of challenges for the artist. These climbers know Everest so intimately that they would know if Alan had got something wrong. The ridges, the arétes, the ice fields - they all have to be correct. Hempleman-Adams, who has been given one of Alan's paintings of Everest's North Ridge as a thank you for sponsoring the expeditions, said of the work: "You can see the three steps of North Ridge which you have to climb. It is a very technically, beautifully done painting." 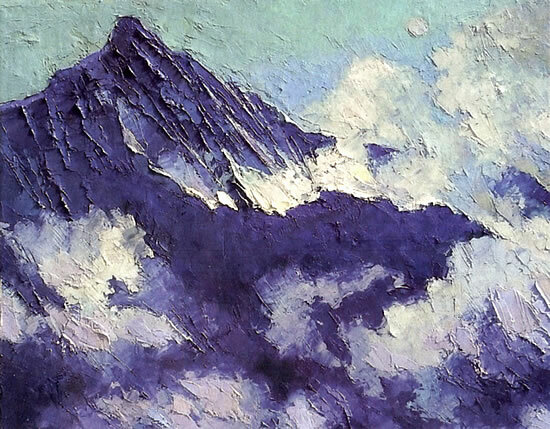 The painting shows the ridge on which George Mallory and 'Sandy' Irvine disappeared during their 1924 expedition - exactly the kind of attention to detail which will attract an international audience of buyers to the exhibition.